To compare two values that are not the same, we can write an inequality. Inequalities can be expressed using greater than (>) or less than (<) symbols. The set of all non negative integers is whole numbers. 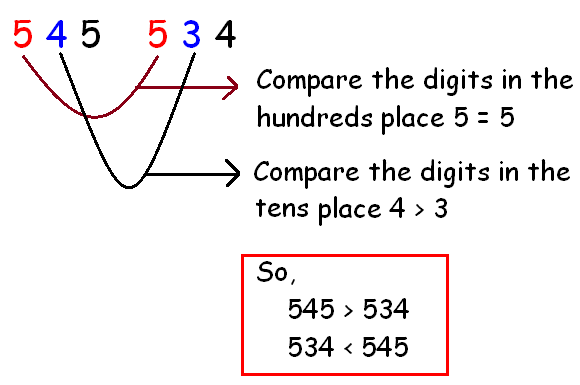 A number which is having more number of digits is greater. We can compare numbers by comparing their place value. Let us see an example problem to understand how to compare two whole numbers. Determine whether 61 is greater than or less than 60.Then write the expression that shows this using < or >. Determine whether 52 is greater than or less than 36.Then write the expression that shows this using < or >. Determine whether 55 is greater than or less than 53.Then write the expression that shows this using < or >. Determine whether 545 is greater than or less than 534.Then write the expression that shows this using < or >. Determine whether 693 is greater than or less than 792.Then write the expression that shows this using < or >. Let us locate the two whole numbers 6 and 9 on a number line and mark them. Here, 9 comes to the right of 6. Therefore "9" is greater than "6"
And 6 comes to the left of 9. Therefore "6" is smaller than "9"
Order the whole numbers 12, 5, 9, 6, 1, 3 from least to greatest. Let us locate the whole numbers 12, 5, 9, 6, 1, 3 on a number line and mark them. From the above number line, write the whole numbers from left to right to list them in order from least to greatest. Locate the two whole numbers 23 and 17 on a number line and mark them. John recorded the following golf scores during his first week at a golf academy. In golf, a lower score beats a higher score. After having gone through the stuff given above, we hope that the students would have understood "Compare whole numbers". Apart from the stuff "Comparing and ordering whole numbers" given in this section, if you need any other stuff in math, please use our google custom search here.